The National Restaurant Association’s (NRA) Restaurant Innovation Summit is underway in Dallas, TX, where FoodLogiQ’s Chief Marketing & Strategy Officer Katy Jones and Chief Technology Officer Charles Irizarry will take the stage today at 10 am, alongside Lucelena Angarita, Director of Supply Chain Traceability at Subway®/Independent Purchasing Cooperative, and Kevin Otto, Senior Director, Industry Engagement-Foodservice at GS1 US. The foursome will present “Blockchain in the Kitchen,” sharing a comprehensive explanation of blockchain technology, focusing on the transparency blockchain offers, and sharing opportunities for restaurant operators to put it to work in their own supply chains. 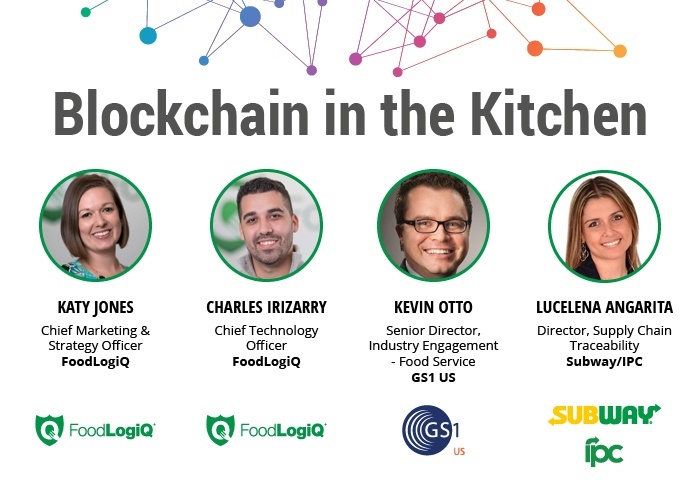 Both Subway®/Independent Purchasing Cooperative and GS1 US are participants in FoodLogiQ’s Food Industry Blockchain Consortium, which launched this summer. Worldwide interest in blockchain spurred FoodLogiQ to begin researching how the budding technology might be used in the ever-changing food industry, and in just a few short months, well-known brands from around the country have joined the Consortium to find out if and how the application of blockchain can raise transparency within their own supply chains. To learn more about FoodLogiQ's blockchain research and the Consortium, visit foodlogiq.com/blockchain.